A Nissan Murano recently rolled into Mike Thomson’s shop at a Nissan dealership in Ontario, Canada because of a check engine light. 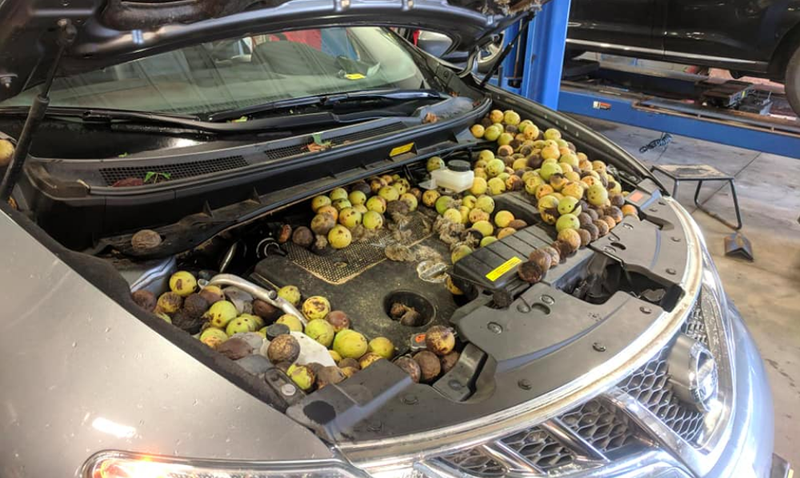 Upon popping the hood, Thomson and his team discovered hundreds of nuts stashed in every nook and cranny of the engine bay. But this year’s surprise is much more voluminous. It’s literally hundreds of what appear to be walnuts hidden in even the tightest crevices. And by “tightest crevices,” I’m not exaggerating. How the heck did this critter get two nuts inside the fender? The car came into the shop because of a malfunction indicator light on the dash, and now Thomson says it won’t start. He’s certain that the vehicle will have some wiring damage, and looking at the image below of all the chewed up insulation and nuts near the wires by the ABS pump, I’m inlined to agree. Thomson says his team will dig into it in a few days. It’ll be interesting to see what they find.